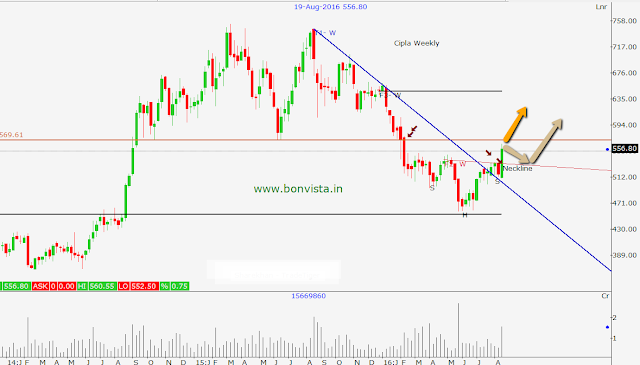 Britannia Industries chart had a typical breakout formation yesterday. Since last one year, precisely since Aug 15, chart was trading in a channel. Yesterday, the stock has exploded with volumes out of this trading channel. This has also confirmed Up Flag Pattern formation. This Flag would be more prominent on weekly chart. (weekly candle yet not completely formed). There is support area near 2995. This breakout is expected to push the stock prices to higher levels. During the days of Jan & Feb 2015 Bharat Forge was one of the favourites of market. The stock has seen healthy correction between April 15 and July 16. That period is more than a year. 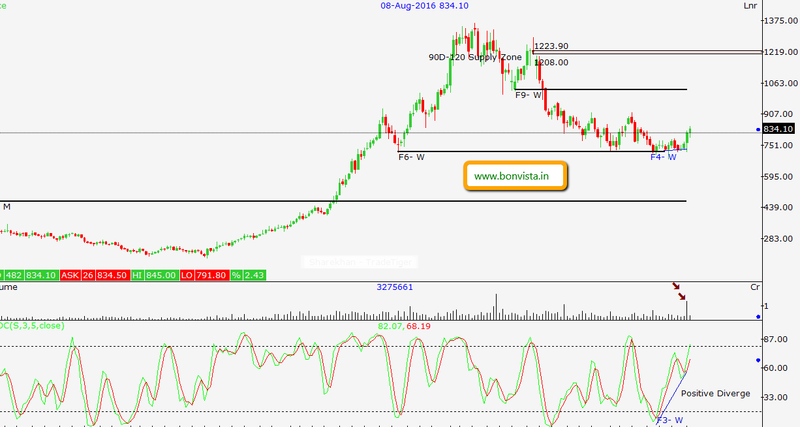 I am tracking Bharat Forge since Nov 15 for a possible up move after the correction. However it took long for this stock the start the well deserved move. Let me explain the larger picture first. On monthly chart you can see that there is a good demand area near the levels of 712 and 823. This is where the biggies would have accumulated the stock slowly and gradually. This accumulation was expected to burst at some point. 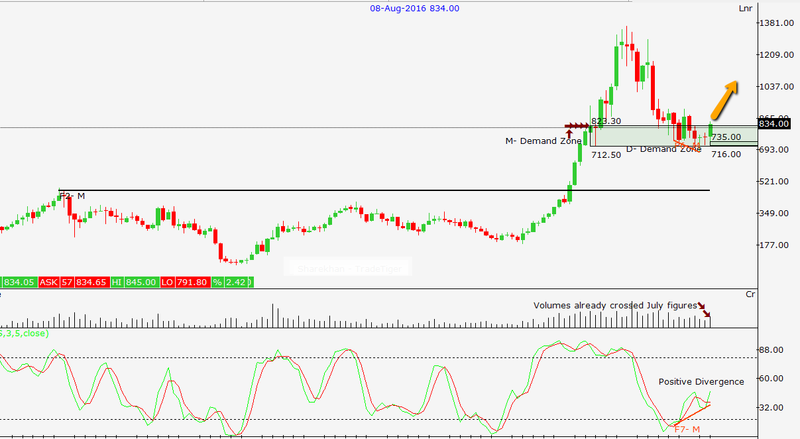 We have seen stock gaining 12% on 5th Aug. Notice the volumes with which it has zoomed. A positive divergence on monthly chart is confirming the momentum. On weekly chart you can see similar observations where the stock is indicating at the possible change of cycle from ‘lower low lower high’ to ‘higher high higher low’. There are some hurdles along the way. However bulls are seen powerful enough to take out these hurdles. 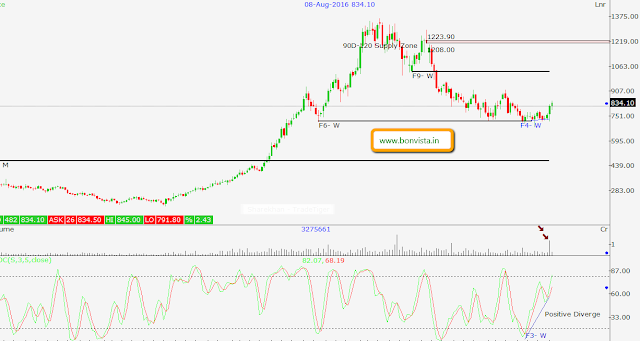 A detailed alert with levels (entry, stoploss and targets) is issued to paid subscribers. For more details you can call me on 9371444875.